EXCLUSIVE! For those who craft-brew their own ale in the garage-or who want to offer a hint about sharing to a brewer friend. 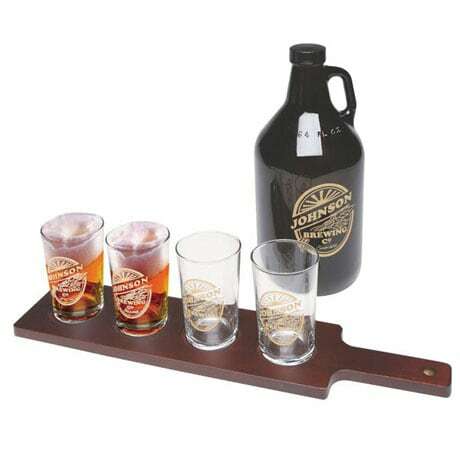 The dark-glass growler is adorned with your choice of name on a professionally designed label; matching tasting paddle has an accent plus four glasses with matching brewing company logos. Hand wash. 64-oz. glass growler; 17"L wood paddle with four 6¾-oz. glasses. Specify up to 12 characters and spaces. Please allow 3-4 weeks for delivery. No rush delivery or gift box. Sold seperatly. Item can only be shipped within the Continental US.